where s is the soundness error, n the length of the input, and ∈ can be any constant < 0. These results only assume that NP ≠ average-BPP. As a consequence, assuming the existence of one-way functions, both classes of proof systems are characterized by the same randomness complexity as BPP algorithms. 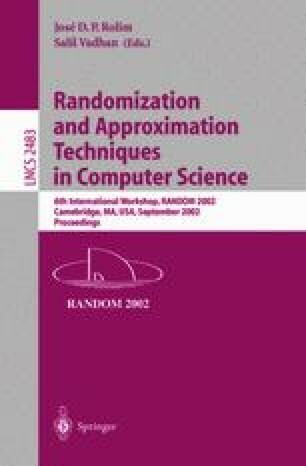 In order to achieve these results, we formulate and investigate the problem of randomness-efficient error reduction for two-round public-coin witness-indistinguishable proofs and improve some of our previous results in  on randomness-efficient non-interactive zero-knowledge proofs. Part of this work done while visiting Università di Salerno.